First-team star helps youngster during sponsored walk at Leeds General Infirmary. 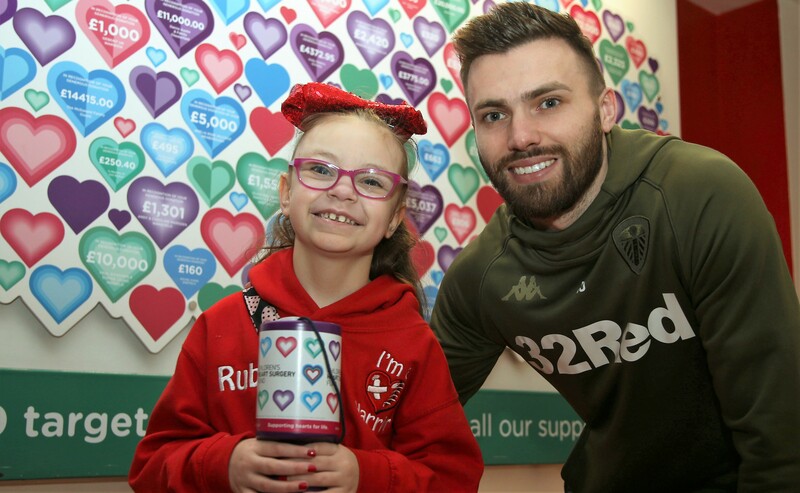 Stuart Dallas joined a very special youngster recently to help her raise funds for the club’s official charity partner of the year, Children’s Heart Surgery Fund. Ruby wanted to do a sponsored walk from one side of Leeds General Infirmary to the other side having spent the last six months at the city centre based hospital receiving treatment. The 10-year-old has complex medical problems and has been supported by the local heart charity since she was six months old when she had to have her first open heart surgery, with her family being told she had a developmental disorder called Williams Syndrome. Dallas wanted to take part in the fundraising activity to help support Ruby as she has built a special relationship with the club since a hospital visit from Kalvin Phillips and Adam Forshaw earlier in the season. The Northern Ireland international spoke to LUTV during the visit and said: “I think it’s very important that we are in a position to come down here and put a smile on people’s faces. To see little Ruby today doing the sponsored walk, she’s an inspiration – she did really, really well and everyone is really proud of her. The club partnered with the local charity that supports babies and young children with congenital heart disease at the beginning of the 2018/19 season. Money raised through the campaign will help to purchase life-saving equipment for the children they work with and also renovate the areas for families based at the hospital - including bedrooms, a kitchen and lounge space. Ellie Brown, Fundraising Manager for Children’s Heart Surgery Fund, spoke about the partnership with the club and said: “The partnership we have with Leeds United has been fantastic and we’ve been really pleased to see just how much the players have been involved, they’ve come down to our ward lots of times and Andrea the club’s owner has been to see us which has been fantastic. “Today has been another amazing experience, we didn’t know if Ruby would be able to do it or not but she did so well and walked really far, I think having Stuart by her side really spurred her on. To have a player here with her today has been perfect. If you would like to donate to Children’s Heart Surgery Fund, to help save youngsters with congenital heart disease that need life-saving surgery please visit justgiving.com/all-leeds-all-heart.